Why do I carry different calls in my turkey vest? The answer is quite simple. There are days when one call will get toms fired up and other days when you use your favorite call and do not get one response. That does not mean the turkeys have left the area. They are still around, just not responding to the call you have selected. I recall this first happening about 10 years ago. I was hunting a small wood lot near my home. There was a light mist in the air as I set out my single hen decoy I put a diaphram call in my mouth and and ran a series of yelps. I would wait about five minutes and then begin the series again, adding some clucks and purrs. I continued this pattern for about 40 minutes. Nothing was responding. I had a few more hours to hunt so I decided to wait it out in that small patch of woods. I thought I would switch it up a little and practice with a slate call I had brought along. I tried scratching out some turkey sounds but all I could get from the damp slate were some very faint yelps. To me they were barely audible but a tom exploded with a thunderous gobble about twenty yards away. I scratched out another yelp and the gobbler came in like he was on a string. I killed him at 10 steps. This call is the most difficult to master but offers the advantage of hands free calling. The diaphram allows you to make those seductive yelps or clucks to close that gobbler without spooking the bird with hand movement. There are two basic types of diaphram calls, clear calls and raspy calls. Clear calls are meant to sound like young hens. They are configured with single or multiple reeds. When I first began turkey hinting,I started out using this style of call (Quaker Boy Pro triple) and killed a lot of gobblers. There were times when I could get a gobbler to answer me on the roost but as soon as he hit the ground, that old boss hen would lead him in the opposite direction. I wanted to put a little rasp in my calling to mimic her but could not figure out how to accomplish this. It was not until several years later that I discovered there were calls designed to be raspy. Raspy calls are constructed with a top reed that has a cut of some shape and additional uncut reeds below. My favorite "go to" call is a HS Strut split V ll, lll or lV. I have killed the majority of my 83 gobblers using this call. This call is one of the easiest calls to use. 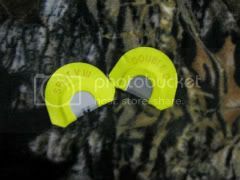 It is very popular with hunters that are just starting out or for the seasoned veteran that prefers this style call. I carry one of these calls in my vest and use it when I am trying to locate a late morning gobbler or when I can not get a response using my diaphram call. The important thing to learn when using a box call or other style call is cadence. Cadence is the rhythm of a call. The next time you are in the field, listen to the sounds of a real hen and try to duplicate those sounds. Also known as the peg and pot, this call produces some very realistic turkey sounds. 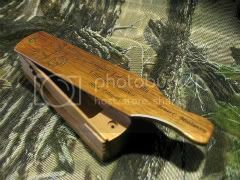 You will need to practice some with this call as it is a little more difficult to use than the box call. The original calls were made with a slate surface on top of a sound chamber. Sounds are produced by scratching a striker on the surface of the slate. Today's modern calls have surfaces made of slate, glass, aluminum or composite materials. The three style calls mentioned above are the most widely used. There are other calls available such as the wing bone yelper and a tube call. I have made several wing bone yelpers over the past few years and plan on using one this coming spring to call in a gobbler. The use of turkey decoys has definitely helped hunters put more spring gobblers on the table. While some states do not allow the use of decoys, New York happens to be one that does. My obsession with turkey hunting began in the late 1960's in Delaware County. My grandfather, Ford Mattice, had ~ 100 acres of land that consisted of hardwoods, evergreens, fields, swamps and ponds. All the ingredients needed to raise quality whitetails and to my surprise, the elusive Eastern wild turkey. 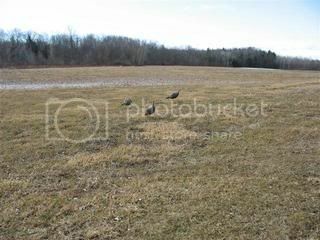 There were not alot of turkeys or turkey hunters in Northern NY at that time. I had read some articles on how to hunt these birds but I had no one to hunt with that had been a successful turkey harvester. Everything I learned was buy trial and error. In the beginning, it was more error but I learned enough to kill my first gobbler (a jake) in my second season of hunting. I have been totally addicted ever since. In those early years I did not use or even know they made turkey decoys. I had harvested a few birds with out the use of any fakes but I was not killing gobblers every season. It wasn't until a decade later that I purchased my first decoy. It was a hard body Carrylite Tom/Hen type of decoy that had the head and body of a gobbler but did not have a beard. I thought this was a little strange but I didn't know any different. I was excited with my purchase as I felt that I had found the key that would make me a more successful and consistent turkey slayer. I have to tell you that I did not kill one gobbler using that new decoy. It seemed to scare the birds rather than draw them closer. Something needed to change. I figured since Toms come to hens, I needed a decoy that looked more like a hen than a Tom. In those days I had limited funds and could not afford to buy a different decoy. So, I gave the one I had a make over with a new paint job. The following spring, I began to have better success with my new "girl" decoy. Not necessarily with long beards, but I was able to call in jakes with regularity. Over the years I have purchased several different types and styles of turkey decoys. I would like to share what has worked for me and what has not worked.......... so far. This combo is my favorite "go to" set up for spring gobblers. I have killed more mature long beards hunting over this pair than any other set up in my arsenal. 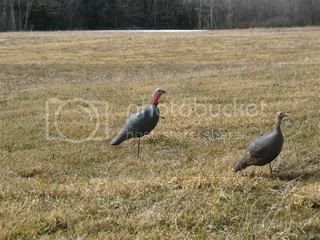 The reason, mature gobblers do not like the thought of a jake trying to steal their lady friends. Most of the time they will charge in and head right for the jake decoy, size it up, and try to run it off. If the jake does not initially move, they will do their best to spur the heck out of their opponent. It is at this point in the hunt you should introduce Mr. Gobbler to your favorite turkey load. For decoy placement, I adjust the stake on my hen decoy to be lower than the jake. I plant the jake in a position following the hen with about 5 feet in between decoys. The purpose - when a gobbler comes in, he can circle the jake without bumping into the hen. I have also set up with the hen and jake facing each other with some success but prefer the first set up. If I am field hunting, the decoys are out about 35 yards. In open hardwoods, I usually have them about 20 yards out. I have had instances where mature gobblers would come to the edge of the field, look over the hen and jake set up and not come any closer. I believe these Toms have done battle with jakes in the past and are intimidated. The next time I hunt these gobblers, I leave the jake in the truck and add one or two additional hens. 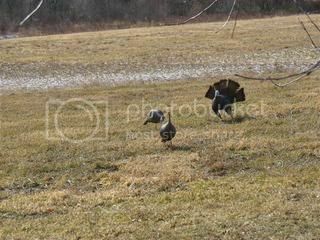 In a three hen set up, I use two upright decoys and a feeding decoy with a motion head. The feeding hen decoy has a very realistic head movement but you need to use this in short grass of cut corn fields as it is difficult to view in taller grass. I place the decoys about 5 yards apart in random positions. The spacing between decoys is very important if you want a realistic look. Hens do not like to feed close to each other. If you observe wild birds in the field, you will notice this. They will also purr when they feed. The purr lets the other hens know when they are getting too close. I purchased a B-Mobile full strut gobbler decoy several years ago. This decoy is supposed to mimic a mature gobbler that has wandered into a boss gobbler's territory. It has a very realistic look, especially when used with a real turkey tail. 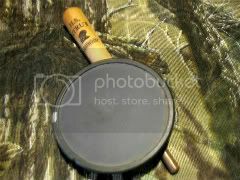 The decoy comes standard with a silk fan and a foldable plastic device that has slots for adding real turkey feathers. The set up I use consists of two hens, one feeder and one upright, and B-Mobile positioned behind the hens. I always place the strutting decoy facing me. I have not used this combo very often and to date I have not harvested a gobbler over this set up.....Yet. I believe if I used this combination more often, I would be successful. I just do not have the same degree of confidence with this set up versus the hen and jake set up. Who knows, maybe this coming spring will be the year B-Mobile earns his keep.